Ø the socialist movement was split at the beginning of the last century into those striving for a bourgeois society and those striving for a dignified human life. Ø the theoretical foundation came from the bourgeois society and not from the oppressed. Ø economically the revolution is overdue, but the subject of the revolution is missing. Ø I am entitled for a dignified human life without service rendered beforehand. Ø After I've slept well and had a good breakfast, I need to be useful to the people next to me. 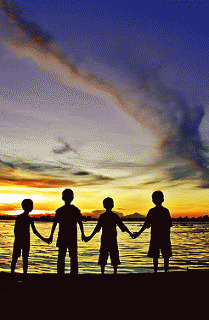 Ø I live in the companionship of about 300 people, providing and organising themselves. Ø I've only sensuous needs, and so they are limited. Ø I live by my identity, not by some identification. Ø I love simple things. Ø I feel part of nature. I was an editor publishing textbooks. Now I am a pensioner. Left activist. Watch the EU! Watch the Western hemisphere! Watch capitalism!